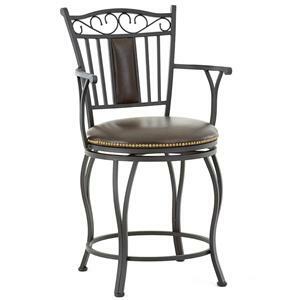 A traditional take on a bar staple, this jumbo swivel bar stool has an elegant look for refined high-top dining. Welded metal creates the frame, with cabriole style legs connected by a circular stretcher, and beautiful shaped detail atop the slatted seat back. Shaped arms provide simple armrests, and the jumbo size ensures you have plenty of space at your seat. The seat offers a foam cushion upholstered in bonded leather, and can spin 360 degrees for easy movement. 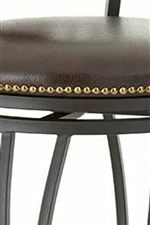 Nailhead trim around the seat completes the stool, for an elegant style that's sure to enhance your refined bar area. The Barbara Jumbo Swivel Bar Stool with Armrest by Steve Silver at VanDrie Home Furnishings in the Cadillac, Traverse City, Big Rapids, Houghton Lake and Northern Michigan area. Product availability may vary. Contact us for the most current availability on this product. Complete your home bar space or pub dining area with the elegant options from the Barbara collection. The group features counter and bar height stools available with or without armrests for a style that suits your needs. 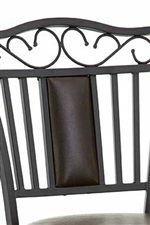 Each chair offers bonded leather seats with nailhead trim, as well as 360 degree swivel mechanism, so you can easily move about in your seat. Welded metal frames with cabriole legs, circular stretchers, and shaped designs over slatted seat backs establish a traditional look that marries function with elegance. 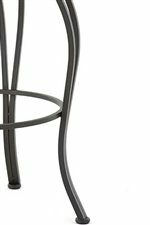 Find the perfect piece for your high top dining area or bar with the refined style of the Barbara stool seating collection. The Barbara collection is a great option if you are looking for Traditional furniture in the Cadillac, Traverse City, Big Rapids, Houghton Lake and Northern Michigan area. Browse other items in the Barbara collection from VanDrie Home Furnishings in the Cadillac, Traverse City, Big Rapids, Houghton Lake and Northern Michigan area.